The weather lately has hardly permitted for me to prance around in dresses, bare legs, and heels - but the sun peaked through the cold and I had to share my dress with you! I found this at the thrift store for $3 (in the Halloween section?! ), and paired it with my new favoritate shoes from B.A.I.T. Footwear! Usually I have the worst luck with shoes that have the slightest bit of a heel, but these are so comfortable and absolutely a d o r a b l e. Thank you so much B.A.I.T.! Currently I have some a couple of projects in the works that I am very excited about (more on this soon, I promise!) - but for now I want to know, what are you looking forward to? Woah! That's an amazing finding!! $3?? ..and as always, I'm looking foward to anything cute, sweet and adorable. You look so cute! Love the dress especially the shoulder detail. I can't believe you found such a beautiful dress in the Halloween section! I'm jealous. That dress is so nice, but Halloween section - why oh why? You find the most amazing dresses! I don't understand how this one was in the Halloween section! lol! My favorite thrift store has an enormous halloween section where they basically just throw all the most ridiculous stuff in the store. Obviously, it's the best section. You look fabulous! That dress is a lucky find. WOW. That dress is amazing. I can't actually believe you found it in a thrift store. For $3. God dammit. LOVE those shoes! All of B.A.I.T's shoes are so cute. And that dress is adorable, great find! OH MY GOODNESS I AM SO ENVIOUS OF YOUR THRIFT STORE LUCK. Oh my gosh this dress is amazing! You look great, I love everything about this, especially the polka dot socks! What a fantastic dress! That's so weird that it was in the Halloween section. It just goes to show you have to look through the whole store sometimes! 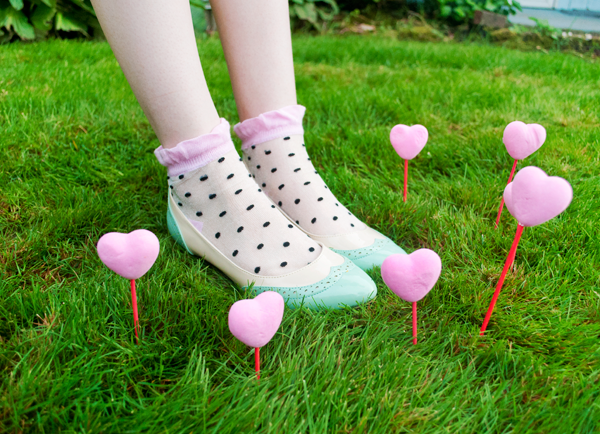 I really love your little shoes and adorable polka dot socks too. $3? Oh my goodness! That is so gorgeous!! That has to be one of the best thrifted dresses ever...you find the most amazing things. Last time I thought your pink dress was the most amazing thing ever!! Simply gorgeous, I love that despite the fact that its fall you still done your springyiest happiest garb! and that dress is to die for!! I am totally in love with your dress! It's simply amazing! I kind of want to marry that dress. It's literally the most gorgeous thing ever. I can't believe you thrifted it, what a find! Lovely! The dress is gorgeous! this dress is so wonderful! I love those socks and shoes together!! I'm pretty sure I squealed when I saw the photo with the little hearts. Be still my heart. I looove your dress Kailey! $3?? in the Halloween section?? Amazing! Perfectly accented by your lovely shoes! There you go finding amazing thrift treasures again! I have the worst luck with thrift stores around here, it's all pretty much "blegh." The shoes are so cute! Honestly I am looking forward to this month being oooooover. So much stress this month! I just discovered your blog! It was love at first sight. OMG! How have I only found your blog?! I love that dress, so jealous that you got it for such a fabulous prize! So so jealous - you look so beautiful! It's the perfect tea dress and I really love the shoulder details! oh wow, you look like a real princess <3 totally love this dress ! :) you look stunning ! Wow your dress in sooo cute!! Ooh, that dress is so pretty, and I LOVE those shoes! You are so pretty! That might just be the greatest thrift store find ever! Literally my dream dress! It makes me want to go thrifting right now just with hopes of finding something even slightly similar! Love the dress, and those shoes are utterly adorable! eep, i just found your blog and am in love. it's gorgeous. Looking gorgeous! Those shoes are to die for. i love this! 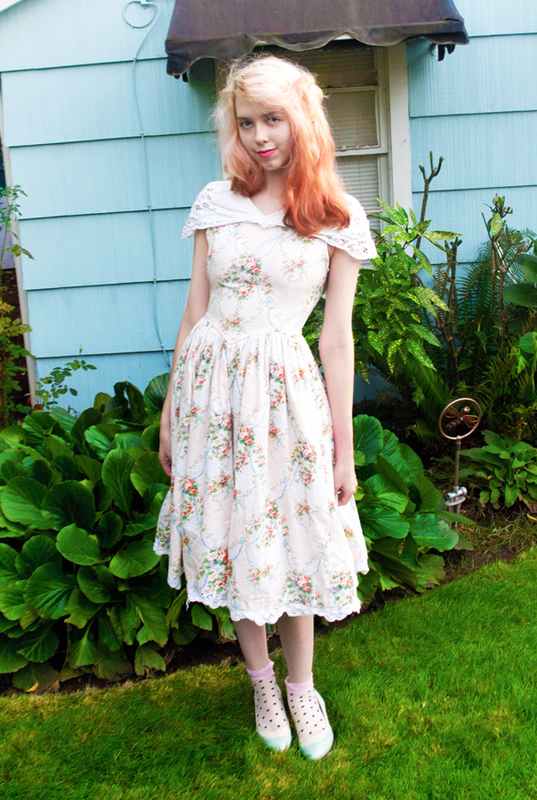 you are so pretty and the floral dress is perfect! thank you so much for the sweet comment on my blog, it means so much because your blog is one of my favourites, it has such a pretty aesthetic. and i love your hair. i hope you have a wonderful day. like a true mermaiden, your blog is incredible, as is your hair. i hope you drop me a note sometime! oh Kailey, this is such a pretty dress. I haven't been here on your blog for a while, and I have to tell that I quite missed this little escape to pink universe. I want your hair! 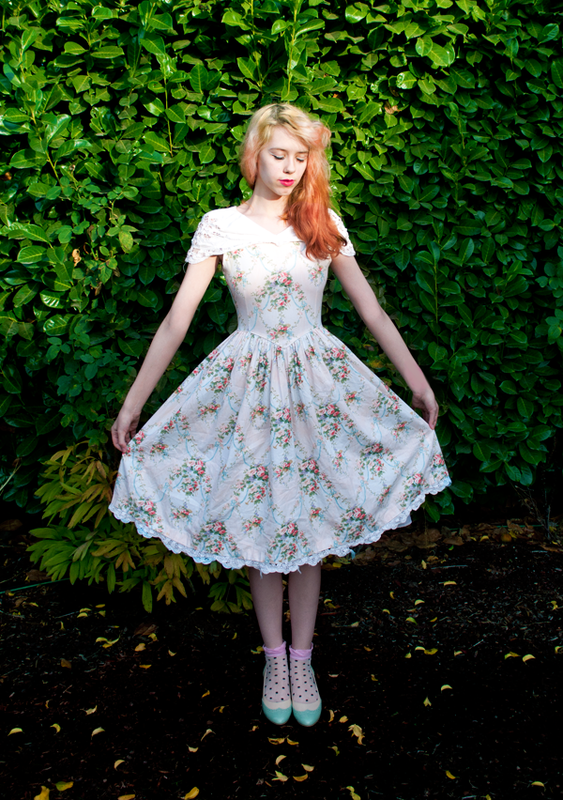 and this dress is unbelievably pretty! This dress is soooo pretty! the dress is perfect on you, what a catch! How fantastically pretty. 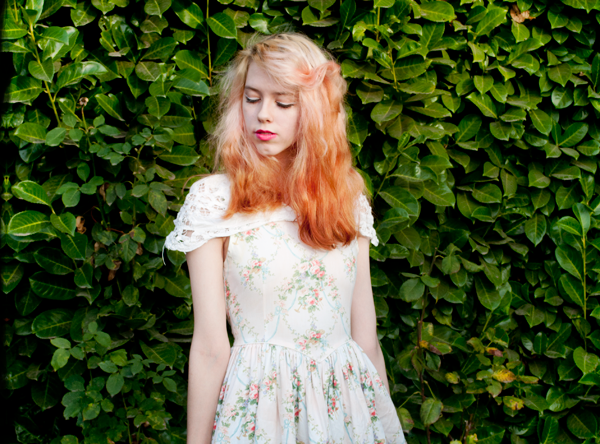 That has to be one of the most beautiful dresses I've ever seen anyone find from a thrift store. Goodness, it's one of the most beautiful dresses period, and looks nothing short of enchantingly lovely on you, sweet dear. lovely, and i really like your hair too! Mesmerizing! The dress, the color, the prints, I love everything.